"Fight me, I'm right here!" Cethegus was a Jiralhanae chieftain of the Covenant who led his pack throughout the Human-Covenant War. "You must win this fight on your own. Failure will bring a fate worse than death—abandonment, as we step forward. Out." Becoming the chieftain of his pack after climbing the ranks of Jiralhanae society, Cethegus led his pack for decades. During his career, he outwitted Kig-Yar mercenaries and served in numerous battles across human colonies throughout the Human-Covenant War. As the Great Schism dawned on November 3, 2552, Cethegus gladly followed the San'Shyuum in their betrayal of the Sangheili. 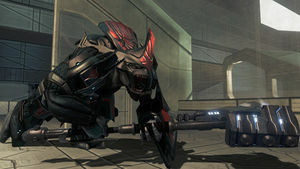 However, after Chieftain of the Jiralhanae Tartarus' demise on Installation 05 at the hands of Arbiter Thel 'Vadam, a power vacuum was left behind, which Cethegus sought to occupy. On December 11, 2552, Cethegus and his pack were among the Covenant forces brought to Installation 00 alongside the High Prophet of Truth's fleet. As the Battle of Installation 00 began, Truth moved to initiate the Great Journey by firing the Halo Array while the Covenant attempted to destroy attacking human and Sangheili forces. As the Arbiter and Spartan-II Master Chief Petty Officer John-117 left the Cartographer, Cethegus and the members of his pack were charged with halting their progress. Encountering the Spartan in the Cartographer, Cethegus dispatched several of his Jiralhanae Stalkers to eliminate John-117 while he retreated. Cethegus regrouped with the Jiralhanae Jumpers of his pack, where he exchanged communications with Truth. Meanwhile, the Spartan killed the Stalkers and moved towards Cethegus' position. As John approached the Jiralhanae, Truth ordered Cethegus to kill the Spartan himself, to which the chieftain readily agreed. Believing that he would ascend to the title of Chieftain of the Jiralhanae for killing the Spartan, Cethegus charged John alone with his Type-2 gravity hammer. However, John eventually succeeded in killing Cethegus. The rest of the chieftain's pack, flanked by Kig-Yar marksmen fruitlessly attempted to avenge their commander. "The pack will feast on you!" Cethegus was a Jiralhanae devoted to the Covenant's religion and a loyal follower of the San'Shyuum. As his time as chieftain, he led his pack with fervent conviction and fierce renown. An opportunistic Jiralhanae, Cethegus aggressively climbed through the ranks of Jiralhanae society with a mixture of cunning and bloodlust. However, after attaining the title of chieftain, Cethegus found that further opportunity to advance eluded him. After Chieftain of the Jiralhanae Tartarus' death, the resulting power vacuum finally created a way for Cethegus to rise. After the High Prophet of Truth personally ordered him to kill Spartan John-117 in single combat, Cethegus saw it as his divine hour, believing he would advance to the position Tartarus once filled if he proved successful.